Help us save the Dorrance property. 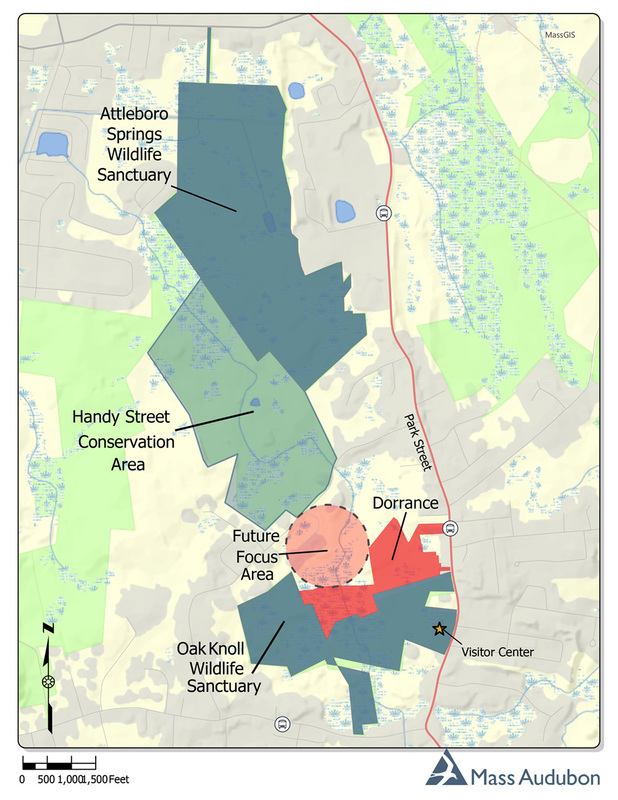 Mass Audubon has the opportunity to purchase 25 acres of open land adjacent to Oak Knoll Wildlife Sanctuary in Attleboro, offered for sale by the Dorrance family. To make this happen, we need your support to raise the necessary $375,000 by June 2019. Located in the densely populated city of Attleboro, and situated on a public transportation route, Oak Knoll provides important benefits to both people and wildlife. More than 20,000 people live within a two-mile radius of the sanctuary, making it one of the most significant settings for Mass Audubon to connect people with nature. School programs and summer camp are just some of the educational opportunities offered for the community, serving over 10,000 youth and adults annually. Protection of the Dorrance property will bring us just one additional parcel away from creating a 275-acre open space corridor in Attleboro. Open space corridors are important because they help plants and animals move as needed in a changing climate. Mass Audubon is reaching out to landowners to create this permanent link, which would physically connect Oak Knoll to Attleboro Springs Wildlife Sanctuary. This sister sanctuary, located 1.5 miles to the north, includes a universally accessible All Persons Trail with rope-guides, audio tour interpretation, large print, Braille, and tactile format resources. We can’t take this important conservation step without your support! To turn the option into a purchase, we need to raise $375,000 by June 2019. Please consider making a gift today to help make this vision a reality. To learn more, or make a gift by phone, please contact Liz Albert at 781-259-2104 or by email.